Rachel Laurin’s compositions for the rare combinations of organ and harp, organ and French horn, as well as fourteen solo organ works, all created 2007-2011, are played on the interesting romantic/orchestral organ at St. Anne’s Church, Ottawa, built in 1917 by Casavant Frères using most of the organ built in 1914 by La Compagnie Canadienne d’Orgues, a firm that coexisted 1910-1930 with Casavant in St. Hyacinthe, Quebec. It was rebuilt by Casavant in 1988 and revoiced in 2011 by Alain Gagnon Pipe Organs, Kingston, Ontario. Rachel Lauren plays all of the solo organ works on the CD, and is joined by harpist Caroline Léonardelli for the three-movement Fantasia for Organ and Harp, op. 52, commissioned for the 2010 AGO National Convention held in Washington, DC. The Sonata for Organ and Horn, op. 60, in three movements, is played by organist Karen Holmes and hornist Damian Rivers-Moore. Karen Holmes, president of the RCCO 1996-98, commissioned the work for performance at the 2011 RCCO National Convention in Hamilton, Ontario, and played it there with Rivers-Moore, her nephew. Solo organ works include Epilogue, op. 50 (First Prize winner of the Marilyn Mason New Organ Music Competition 2009), Prelude and Fugue in F Minor, op. 45 (winner of the Holtkamp-AGO Composition Award 2008), and Twelve Short Pieces, Volume 2, in contrasting characters and atmospheres intended for concert and church use. I confess that the name of Rachel Laurin was not familiar to me until I received this CD for review. . . Her music is approachable and enjoyable but by no means bland. I has some of the piquancy of Ravel, the harmonic inventiveness of Holst and the rhythmic vitality of Walton. She is obviously at ease with formal musical structures, sonata form, fugue, and so on. Most of all, one senses that she enjoys composing and her enjoyment is conveyed to the listener in all of these pieces. The Fantasia for Organ and Harp and the Sonata for Organ and Horn demonstrate . . . that the organ can take its place in the wider family of chamber music. . . The performances and recording are excellent: Rachel Laurin is a virtuoso player as well as a composer with an original and attractive voice. My favorite? The Fantasia for Organ and Harp, which I enjoy more every time I hear it. If Rachel Laurin's name and music are unfamiliar to you as they were to me, please take my word for it: you will enjoy this CD. Strongly recommended. One need only listen to the Epilogue, Op. 50 to conclude that Rachel Laurin is not an organist who merely dabbles in composition, but rather a solid composer who also happens to be a fine organist. It's built around three main ideas led by a turbulent and agitated introduction, a beautifully melodic second subject, and a hymn-like progression of broad chords that expose Laurin's French Roman Catholic upbringing, that all merge into one heck of a piece of music that would put any organist to the challenge. And at the other end of the spectrum lies the strangely compelling Fantasia for Organ and Harp, Op. 52 in which harpist Caroline Léonardelli and organist Rachel Laurin weave together beautiful sounds from both instruments producing a wide gamut of effects and colors re-inforced by the quality of the writing. Each and every piece on this new CD has something different and substantial to say. From the deeply expressive slow movement of the Sonata for Organ and Horn, Op. 60 to the quirky Fuga Comica from the Twelve Short Pieces where the joke is on the poor organist who has to learn how to play it, every one has a character all its own and the stamp of a great composer. An added attraction, and an extra bonus for me in particular, is the fact that this recording was made in the Ste-Anne Church in Ottawa, Canada. A church where I myself was organist for about 25 years. Unfortunately for me, I left that position about two years before they decided to renovate the organ in 1988. It's a fine Casavant 40 stop instrument built in 1917 that, while I was organist there, was plagued by many problems mostly caused by neglect and also bits of plaster and drywall dust stuck in the pipes from building renovations that had occured many years before. The 1988 rebuild seems to have brought it back to its original glory. It's an organ blessed with beautiful flute and wood stops. Raven Recordings once again does what it does best by presenting to us music, musicians and instruments off the beaten path. May the discoveries never end. This recording presents a part of my organ compositions written in a relatively short period: between 2007 (opp. 45 and 48) and 2011 (op. 60). One particular aspect of this CD consists in the presentation of music for organ and other instruments. The Fantasia for Organ and Harp and the Sonata for Organ and Horn bring a widened range to my organ catalogue. These two commissions offered me the occasions to do what I love: writing for my own instrument, the organ, and composing chamber music for any instrument. Many organists feel isolated in their organ loft and try to find a balance in their musical life, looking for repertoire they can perform as equal partners with other musicians instead of having only the limited role of accompanist. This fact creates a great opportunity for composers to write new pieces adapted to these needs, and my own approach when composing for organ and other instruments as an ensemble, is to use each instrument in its whole range of sonorities and nuances, in an equal dialogue. The challenge is to find a good balance between these instruments and to avoid the overuse of each one in a clichéd manner. For example, the organ in the Fantasia will present a rhythmical aspect as well as the harp, and both in various sections will be juxtaposed in a legato-versus-staccato musical relationship, intended to surprise and make the audience aware of the unlimited possibilities of both instruments. In the solo organ pieces, I wanted to demonstrate some pieces that are not included in the magnificent CD by the brilliant virtuoso Isabelle Demers Rachel Laurin/Oeuvres pour Orgue (Acis APL61256). The Prelude and Fugue in F Minor, op. 45 and Epilogue, op. 50, are two “lucky” compositions having won prestigious awards: the Holtkamp-AGO Composition Award in 2007 (Prelude and Fugue) and the Marilyn Mason New Organ Composition Competition in 2009 (Epilogue). Composed specifically for these competitions, these winning pieces played a very positive role in my career as a composer, confirming a recognition that had been denied in my first years as a creator because of the accessible language of my music, prejudicially seen as “not contemporary enough” in some parts of the music world! Fortunately, these kinds of prejudices are gradually disappearing, paving the way to a golden age in music creation where, once again, creators will be allowed to express their inner personalities freely. The Twelve Short Pieces, Volume 2, are part of a series of uninterrupted production in my organ catalogue. Volume 1 is included in the CD of Isabelle Demers, and I have just recently completed Volume 3. Each book contains twelve short compositions of very contrasting characters and atmospheres, and of differing levels of difficulty from easy to medium- difficult. These are destined for concert use as well as for liturgy, and they allow me to explore and express other facets of my musical personality. With a shorter time to build an impression, these pieces also bring useful recital repertoire to complete a program, with the possibility to explore some stops and colors neglected in longer works. Some of these constitute for me a “fun” writing exercise, such as the short fugues, duos, trios, etc. Finally, the ultimate objective is to communicate with you, music lovers, with human beings of my era! In this spirit, we ought always to keep in mind how each one of us is indispensable to the other. Every performer involved in this recording demonstrates it in the most convincing fashion. Each of them generously brought my music to life by his or her brilliant art and spirit, as well as by his or her energy and time, and from the depths of the heart. Without these performers, music could not exist. Let us keep this in our thoughts each time we take this album in our hands, and, hopefully, put it in the CD player! First Prize of the Marilyn Mason New Organ Music Composition Competition 2009, Epilogue was composed during the fall of 2008. In rondo form (with a refrain repeated between each verse, in a different setting), Epilogue begins with a theme in C minor, played in a powerful unison. The first verse brings an aria-like second theme. The next verse introduces a third subject in a quiet and majestic chorale texture. Melodic developments of the refrain are exposed in a light carillon sound. The next verses bring two new melodic developments derived from the principal theme, once as a trumpet call, the other time with a “zimbelstern” effect in the left hand. The second theme is restated before the ultimate passage reunites the chorale theme and the refrain motive in a sparkling toccata-carillon in C major. This work is dedicated to Marilyn Mason. Commissioned by the AGO National Convention, Washington, D.C./2010, the Fantasia for Organ and Harp, op. 52, was composed in 2009. It is a cyclic piece, three-movements-in-one, conceived in the classical structure fast-slow-fast. But, as its title indicates, the Fantasia has an improvisation-like character, and the listener will find in this unusual duet a rather unique structural form. Among the oldest musical instruments of civilization still in use, the harp and the organ are presented eclectically through two contrasting themes. These melodic and rhythmic motives are treated throughout the work, the first one beginning in a medieval sonority (Misterioso) and the second one exposed in a “jazzy” color (Allegro giocoso), demonstrating the evolution of musical language during the existence of these both old and modern instruments. Both themes find a unity of romantic style in the peaceful Andante pastorale (middle movement) while, in the third section, a more symphonic, dramatic, and triumphant atmosphere renders a conclusive impression of a festive gathering in the heavens, with angels playing harps, trumpets and percussion instruments in a perfect agreement of the two characters, and a synthesis of time! This work was premiered at St. John’s Church, Lafayette Square, Washington, D.C., by Jean-Baptiste Robin, organist, and Elizabeth Blakeslee, harpist, in July, 2010. This organ and harp duet soon became popular among organists and harpists, and it appears regularly in programs for organ and other instruments. The two musicians on this recording performed it several times together in concerts in Ottawa, and it is worth mentioning here that Caroline Léonardelli instructed the composer about writing for harp and the technical idioms of this instrument as the work was conceived. The following twelve short and contrasting works are intended for concert use as well as for liturgy. Hommage à Couperin, op. 48 is an organ transcription of the first of Four Preludes, op. 48, for harpsichord (2007). It is a two-part melodic piece, with the texture of early French music and modern modulations. It is dedicated to Karen Holmes, one of the performers on this CD. A “Royal Canadian Fanfare,” op. 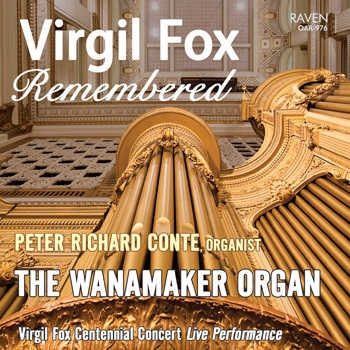 53, was composed in tribute to the centenary of the Royal Canadian College of Organists (2009). The “Royal” aspect is heard in the second half of the piece, in a short allusion to God Save the Queen, while the “Canadian” part is played through a brief excerpt of O Canada a few bars before. It is dedicated to Barrie Cabena, organist, prolific composer, and former President of the RCCO. The Three Bagatelles, op. 54, were composed in 2009 and commissioned by Artis Wodehouse, who wanted to build a modern repertoire to be performed on her historic Mason & Hamlin Liszt reed organ. Perpetuum Mobile, op. 54, no. 1, is a kind of improvisational arabesque, adapted to the organ by manual changes, registration dynamics and the addition of a pedal part ad libitum. Meditation, op. 54, no. 2 is also adapted to the organ in an orchestral manner, transformed in a colorful and reflective movement. Dance and Variations, op. 54, no. 3, includes six very contrasting variations on a short theme, also arranged for the organ in a variety of sounds, from the foundations to the clarinet solo, or treble principals alone, concluding with a strong Tutti in a boogie-woogie atmosphere! The three pieces are dedicated to Artis Wodehouse. Soliloquy, op. 58: The seven short pieces of op. 58 were composed during the fall of 2010 and are dedicated to dear friends of the composer who played a precious role in her musical life, by their teaching, by performing her music, by their generous help, or simply by their friendship. Soliloquy presents a solo melody in the right hand, here played on the oboe of the Swell, in a meditative mood. It is dedicated to Ottawa organist Mervyn Games. Ciaccona, op. 58: Twelve variations on a six-bar ostinato, played in the bass or in the soprano. It is dedicated to Baltimore organist Marvin Mills and can be heard at www.RachelLaurin.com. It is omitted from this CD to comply with the duration limitation of high quality CD production. Prelude, op. 58: A gentle ternary moto perpetuo, it may serve as an introduction to the following fugue, both in A minor. It is dedicated to Montreal organist Gaston Arel. Fuga seriosa, op. 58: The melodic subject is derived from the first notes of the Prelude. The end of the fugue seems to liberate itself from the “serious” spirit of the piece, bringing a free descending movement in a modal stringendo, preceding the final Più lento. It is dedicated to Montreal organist Lucienne L’Heureux-Arel. Divertimento, op. 58: Dedicated to the Italian organist Massimo Nosetti, this short piece brings the lightness and sun of his country in the first theme, interspersed with a “prayerful” and religious section heard on the Célestes. These two subjects evolve throughout the piece before fleeing under the sun! Canto lugubre, op. 58 is in a total contrast of mood with the preceding piece, as the title suggests. This musical moment may express the mystery of life and death, with the spiritual elevation of the soul, symbolized by the Flute 4’ solo mixed with the tremolo. It is dedicated to Calgary organist Neil Cockburn. Fuga comica, op. 58 does not need explanation: a fast two-part fugue, very light, and not so far from the burlesque, even if it could be qualified as “serious” by its structure and writing! It is dedicated to Minneapolis organist Melanie Ohnstad. 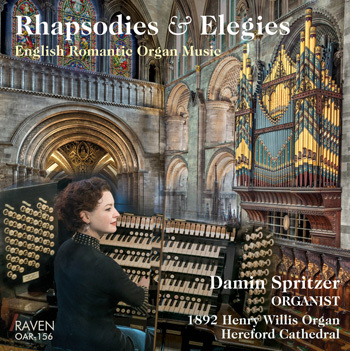 The Sonata for Organ and Horn was commissioned by Karen Holmes and premiered at the Royal Canadian College of Organists National Convention in Hamilton, Ontario, July 19, 2011, at the John Bell Chapel, Appleby College, in Oakville, by the two performers on this recording. The sonata is in three movements: an Allegro in traditional sonata form with two contrasting themes; a slow movement, freely structured and descriptive in character; and a Fugato in Rondo form, in which the main fugal theme returns regularly as a refrain. By coincidence, this painting resides in the Art Gallery of Hamilton, in the same city that welcomed the RCCO 2011 Convention where the premiere took place! With the kind permission of the Hamilton Art Gallery, this masterpiece by Thomson is reproduced on the cover of this recording. Winner of the Holtkamp-AGO Composition Award 2008, the Prelude and Fugue in F Minor, op. 45, was completed on February 24, 2007. The Prelude presents a long melodic and monodic line (legato e cantando) on a C pedal note, and develops, through modulations and more harmonic treatment, into a strong crescendo during which the theme moves to the pedal. Freely structured, this lyrical motive alternates between contrapuntal and harmonic textures, finally concluding in a quieto e cantabile atmosphere, where the melodic line presents the theme, now inverted, on a flute stop, accompanied by lush chords on the Voix célestes. The Prelude concludes with a recall of the initial melody ending on a very soft chord morendo. In contrast, the following four-part Fugue introduces a staccato, rhythmical, and energetic subject. The first episode, in A Minor, moves into E Major as the subject moves to the pedal. After many expositions of the theme, sometimes presented in reverse or in its original presentation, another episode appears, in G Minor, recalling the more ethereal atmosphere of the Prelude’s melodic theme. The Fugue’s subject reappears in B-flat Minor under this expressive line. During the re-exposition, the subject of the Fugue, presented in canon between the soprano and the pedal, mixes with the intermediary voices which consist of a two-part melodic line borrowed from the Prelude. The two contrasting motives seem to fight it out among themselves as though to see which one is the more important, the result of which provides a somewhat improvised- sounding Toccata when the rigorous fugal lines “break down,” to give way to an agitated and almost demented ambiance (agitato e con brio), followed by a series of joyfully bouncing F Major chords! Rachel Laurin, organist, composer and improviser, was born in l96l, in St-Benoît, Quebec, Canada. After her studies at the Montreal Conservatory, she became Associate Organist at St-Joseph’s Oratory, Montreal (1986-2002), then Titular Organist at Notre Dame Cathedral, Ottawa (2002 to 2006). She now devotes herself to composition, recitals, master classes and lectures. She has performed organ recitals in major cities in Canada, the United States and Europe, and has made more than a dozen recordings on the Motette, Musicus, Musicus/Fidelio, Analekta, SRC (Radio-Canada), Riche Lieu, BND, and Raven labels. In 2000 in Montreal and 2001 in Ottawa, she played the Six Organ Symphonies by Louis Vierne in three recitals. In 2002, at the inauguration of the Edmonton Winspear Centre’s new Létourneau organ, she performed the premiere of Jacques Hétu’s Concerto for Organ with the Edmonton Symphony Orchestra conducted by Mario Bernardi. She presented this same work at the Ottawa National Arts Center in 2008, and in Toronto at Metropolitan United Church during the Centennial Convention of the RCCO in June, 2009. She also performed Raymond Daveluy’s Organ Concerto at the RCCO National Convention in Hamilton in 1999. Rachel Laurin is an Associate Composer of the Canadian Music Centre. She has composed more than a hundred works for various instruments, instrumental ensembles and orchestra. These works have been performed and recorded in major cities in America, Europe, Asia and South Africa. Her compositions are published by Doberman, RCCO Music Publications (Canada), Europart (France), Hinshaw Music and Wayne Leupold Editions (USA) where she has been House Composer since 2006. She has won many awards, including the Prix Conrad-Letendre, the Holtkamp-AGO Composition Award in 2008, and the first prize in the Marilyn Mason New Organ Music Competition in 2009. She is frequently invited to major organ festivals as organist and composer, and was a recitalist at the AGO National Convention in 2008 (St. Paul / Minneapolis), and a commissioned composer for the AGO National Convention in 2010, in Washington, D.C. She also presented the opening gala recital of the RCCO Centenary National Convention in Toronto in 2009. Rachel Laurin is well known as an improviser, and she has had many opportunities to teach this art in schools and academies: at the Montreal Conservatory, in Épinal, France, in many RCCO and AGO workshops, in Calgary as a faculty member at the Mount Royal Summer Academy, where she was also in charge of a composition class; in the Summer Institute of Church Music (Whitby, Ontario) and others. In November 2009 and March 2010, she was “Distinguished Guest Artist” at Yale University, invited as a lecturer, teacher and concert artist. Her recent activities as a composer included her Fantasy and Fugue on the Genevan Psalm 47 for organ duet, Op. 62, premiered at the Edmonton Winspear Centre by the Majoya duet, in September 2012; compositions and premieres of works for organ and oboe (St. Lawrence University, Canton, New York), solo organ, and voice and piano, among others. A feature-length program devoted to her was broadcast in October 2012 by American Public Media’s Pipedreams presented by Michael Barone. Karen Holmes was born in Toronto and completed an A.R.C.T. in piano and a BA in modern languages at the University of Toronto. With a scholarship from the French government, she spent three years in France and earned a Premier Prix in organ at the Conservatoire de Toulouse in the class of Xavier Darasse. She also attended summer courses in St.-Maximin, France, and Haarlem, the Netherlands. Karen Holmes holds the diploma of F.R.C.C.O. and was national President of the Royal Canadian College of Organists (RCCO) from 1996 to 1998. She continues as a member of the national examinations and music publications committees. She has served on the executive committee of the Ottawa Centre of the RCCO for many years and is currently chairing the planning committee for the 2013 National Convention. She has taught organ, harpsichord, and Baroque ensembles at the University of Ottawa. She performs frequently as a solo organist and harpsichordist as well as in chamber music ensembles. She has made two CD recordings: Kaléidoscope Bach Kaleidoscope featuring music by members of the Bach family for organ, harpsichord and fortepiano; and Canadian Musical Heritage recorded on the organ of Ste. Anne Church, Ottawa. Karen Holmes has held positions in several Ottawa churches, and is currently Organist and Music Director at St. Peter’s Lutheran Church. Caroline Léonardelli, born in France, graduated at the age of 18 with first prize in harp from the Conservatoire de Paris where she was guided by Jacqueline Borot. During her youth, she studied with the celebrated harpist Lily Laskine. After immigrating to Canada, Caroline completed an Artist Diploma with Judy Loman at the Schulich School, McGill University. A concert harpist of great reputation, she is also accomplished as a chamber and orchestra musician, and teacher. Caroline is known for her passionate and bold interpretations of French and Canadian repertoire. Her first solo recording, El Dorado, received a 2010 JUNO nomination in the category of Classical Album of the Year/ Solo or Small Ensemble. This recording, featuring the Penderecki String Quartet and bassist Joel Quarrington in the title composition, received exceptional reviews in Gramophone magazine, The Whole Note, Classical Music Sentinel and the highest ranking (six stars) from La Scena Musicale. All of her recording projects have received critical acclaim including Panache with mezzo soprano Julie Nesrallah, Impressionisme by the Para Arpa Duo, and A Christmas Story with the Ottawa Bach Choir. Caroline Léonardelli’s recent orchestral performances include Marjan Mozetich’s The Passion of Angels double harp concerto with the Orchestre symphonique de Gatineau, the Rodrigo Concierto serenata for harp, and Michael Conway Baker’s Concerto for Harp & Orchestra with the Ottawa Chamber Orchestra. The 2012 season’s festival appearances include Music and Beyond, Ottawa International Chamber Festival, Elora Festival, Kincardine Summer Festival, World Harp Congress, American Harp Society in New York, and a tour in France in November 2012. She is principal harpist with the Ottawa Symphony Orchestra and the Orchestre symphonique de Gatineau. She has also performed as a guest with numerous orchestras including the Montreal Symphony Orchestra, Kitchener-Waterloo Symphony, London Symphony (Ontario), Symphony Nova Scotia, Opera Lyra, Orchestre symphonique de Québec and the National Arts Centre Orchestra. In 2012, she received the Canada Council for the Arts Mid-Career Award to develop a new program with Kathleen Bride at the Eastman School of Music. Damian Rivers-Moore is a member of the Thunder Bay Symphony Orchestra. When away from Thunder Bay, Damian has played horn with the Winnipeg Symphony Orchestra, the Hamilton Philharmonic Orchestra, the Toronto Operetta Theatre, and has joined the ranks of the string and wind virtuosos of the Montreal and Kitchener-Waterloo Symphony Orchestras. Damian Rivers-Moore obtained his post secondary education from the University of Western Ontario where he studied with Derek Conrod, the Glenn Gould Professional School of the Royal Conservatory of Music in Toronto where he studied with Christopher Gongos, and Montreal Conservatory where he worked under John Milner. Immediately after completing his performance degree from the GGPS in 2001, Damian took up his first professional orchestral engagement in Guangzhou, China, as principal horn. Damian performs concerts with his aunt, Karen Holmes, and is delighted to participate in this recording with Rachel Laurin. The organ at Sainte-Anne Church was built in 1917 by Casavant Frères of Saint Hyacinthe, Québec, using the parts of an organ built for the church in 1912/14 by La Compagnie Canadienne d’Orgues, a firm that existed in Saint Hyacinthe 1910-1930. The Casavant firm rebuilt the organ in 1988. The Saint Hyacinthe products replaced a one-manual pipe organ bearing the name of A. Pépin and installed in 1889. The Pépin organ was moved ca. 1912 to Saint Charles Church, Ottawa, then to Saint Antoine de Padoue Church, Val-des-Monts, in 1928. It was restored by Casavant in 1993. Nothing is known of A. Pépin.